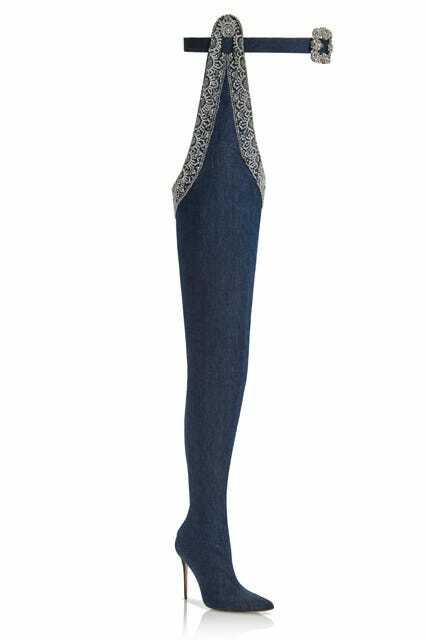 What do you get if you combine Rhianna, Manolo Blahnik and denim? The answer is the greatest collection of shoes the world has ever seen. The star has teamed up with Blahnik on a limited-edition collection aptly titled Denim Desserts and it is incredible. The six items feature more denim than you’d see on your average Brighton hipster plus a generoius sprinkling of sequins and embroidery. The collection will be available in May solely at Blahnik’s boutiques in New York, Hong Kong and London. In a statement, RiRi said “the day I see a woman in the street wearing my shoes…I am sorry for that woman, because I’m going to literally run after her, shouting, ‘Stop! Selfie! Who are you? Where did you get them?”’. Even if they aren’t your thing, it’s worth buying a pair just to have Rhianna ask for a selfie. Imagine having Rhianna ask you for a selfie. It’s okay, we’ll wait while you dream. yes, these are the 9-5s. Seriously. MANOLO BLAHNIK/DENNIS LEUPOLD. Apparently Rhianna’s favourite style is the 9-5- Boot, of which she described as dangerous in a press release; “those boots are dangerous! If you’re trying to get back home to your bed, don’t wear them boots! You will get kidnapped in those boots, those boots are trouble”, she really knows how to sell a pair of shoes. While we don’t think we could see them on Carrie Bradshaw, there will be a lot of people who will want them so you better get yourself to a boutique on May 5th. Oh, and you should have a few pennies lying about as the range starts at £630 and goes right up to £2,800.